Microsoft Corp says that fixes rolled out for security flaws in most processors which may slow down certain servers and decrease the performance of some PCs. Intel Chief Executive Officer Brian Krzanich announced the flaws Meltdown and Spectra in the processors and also informed that it will affect some devices more than others. However, the latest announcement by Microsoft has made us feel that the impact may be substantial than mentioned. Following this statement, Intel share fell by 2.2 percent to $43.75 in New York trading on Tuesday and Microsoft stock soared 0.3 % to $88.50. Microsoft warned in a blog post that the servers that computers that undergird of corporate networks may display “more significant impact.” though, not all the servers will be affected. So far, Microsoft has not provided specific numbers but it is testing various system to check the intensity and will inform users of the findings. WHAT WOULD BE THE IMPACT ON WINDOWS PRODUCTS? Microsoft said that the computers with Windows 10 sold since 2016 will encounter a mere downshift of less than 10 percent which will go unnoticed by users. However, people with older Windows 10 computers will experience a noticeable degradation as their machines have older chips. As far as Windows 7 and Windows 8 computers purchased in 2015 or earlier are concerned, they are said to be the most affected PCs and users will face a significant slowdown in system performance. Since Intel has informed about these two main flaws, Meltdown and Spectre which makes our computer imperiled by hacking. These flaws are said to be in almost all of the billion processors in PCs, phones, and servers, which makes it easy for hackers to unaccredited access to data. Every technology company in the world is releasing software updates to fix the security loophole and try to cope up the issue. There has been intense arguments and speculation about the impacts on the performance of the devices. Doesn’t it seem to be a bit unfair to the people? With more than 99 percent market share in servers, and with chips in more than 90 percent of laptops and 88 percent of desktops sold, Intel is the biggest supplier of chips and servers,Suddenly, processor company announces chip bugs and all the technology companies run to patch the security loopholes on their devices. The outcome is now after the patches are installed, users have to deal with the slow devices for the sake of security. If we don’t install the update, we stay vulnerable to the bugs and if we do install it, we get slow devices as the reward. It seems like we are in between the devil and the deep sea. 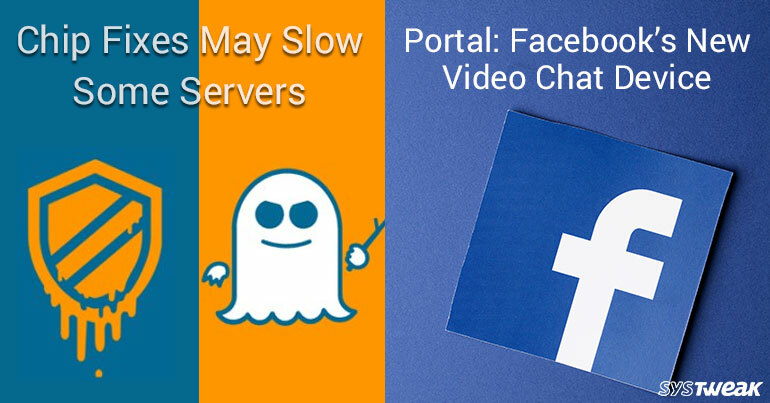 Portal is a video chat device which Facebook is planning to launch at Facebook’s annual F8 developer conference, which is set to happen on May 1-2 in San Jose, California. It will be available to buy at $499.00 later this year. It is said that video chat device will use a wide-angle camera lens to identify faces associated with Facebook accounts. Portal is said to be focusing on video chat with friends and family rather than being just an AI assistant. However, it will respond to your voice commands and might also integrate with streaming services like Spotify and Netflix. WHAT IS THE PURPOSE TO LAUNCH THE PRODUCT? However, the price is not finalized yet, it might get decreased to compete with other competitors such as Amazon Echo show. As the company already knows that the same happened with Google when it launched the first Google Assistant smart speakers with a screen in CES this week. Soon other companies like JBL, Lenovo, and Sony, will follow. Mac Zuckerberg is not concerned about the profit generated as the aim of this is to influence a change in Facebook user behavior.